Looking for a fun activity to celebrate the upcoming Halloween holiday? 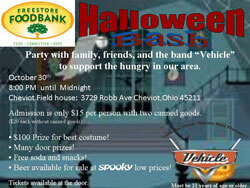 A Halloween Bash to benefit the Freestore Foodbank is planned for this month. The festivities will be held from 8:00 p.m. till midnight Saturday, October 30th at the Cheviot Field House, located at 3729 Robb Avenue. The bash will feature live music, door prizes and a $100 prize for the best costume (so get creative with your look). Admission is $15 a person with two, donated canned goods. Regular admission is $20. Tickets are available at the door. Alcohol will be served. You must be 21 or older to get into the bash. Proceeds will benefit the Freestore Foodbank in the fight against hunger. We hope to see you there!